I've tested the iDevice with the iPhone and iPad mini. It works great for both. (I'm not sure that I'd trust it with a full size iPad, although the manufacturer says it can handle it just fine.) The stand can be positioned at three different angles. It uses rubber non-slip feet and a bumper to keep items from sliding around, even on an airplane folding table. When not in use, it folds flat, taking up virtually no space in your carry-on or shirt pocket. 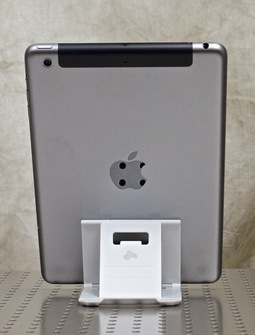 The stand accommodates your phone or iPad in both the horizontal and vertical positions. You'll have to use landscape mode if you want plug-in power, such as using your iPhone as an alarm clock at night. There's no way to plug in the connector when the phone is placed vertically in the stand. This is probably the only drawback to the folding design. Overall, I'm satisfied with the Kanex stand. It's light, very clever, and something that I'll keep stashed in my camera bag. I'm sure it will save the day sometime soon. 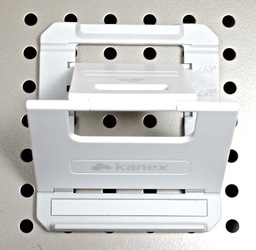 The Kanex folding stand has a high Nimbleosity Rating. What does that mean? You can learn about Nimbleosity and more by visiting TheNimblePhotographer.com.